This DIY Macrame Hanging Planter is a super simple DIY that will add some interest and character to any room. 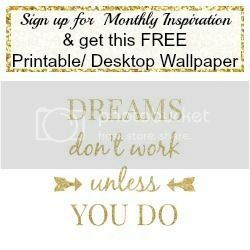 This is a project kit from Home Made Luxe and each monthly project is like Pinterest in a box and contains all the materials you need to create DIY home decor projects like this one plus written and video instructions. 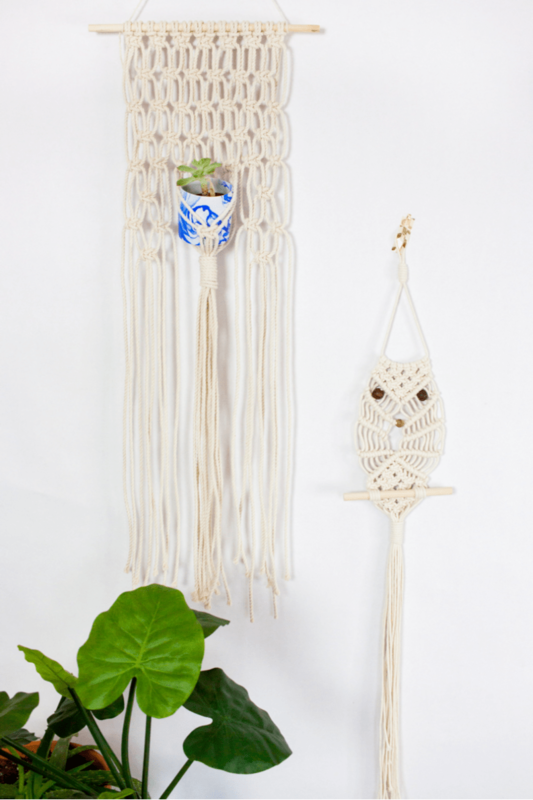 You can grab this DIY Macrame Hanging Planter Project Kit here. Paint planter base white and lid gold. Once dry, use knife to cut slit in lid & push succulent stem through, bending stem to fit. Cut 14 pieces of cord 160 inches each. Cut 2 cords 30” in length & set 1 aside. Tie both ends of the other 30” cord to both ends of dowel, hang on a nail. Larkshead knot (1st row of pics) all 14 pieces of the 160” cords to the dowel. Tie a square knot with each group of 4 cords directly below the row of larkshead knots. To tie a square knot, take cords 1-4. Bend cord 1 to create a “4” shape. Place cord 1 over cords 2 & 3 and under cord 4. Pull cord 4 under cords 2 &3 and through the loop between cords 1 & 2. Pull tight to create the 1st half of your square knot. Repeat the same steps, but this time working from right to left. Take cord 4 and create a backwards “4” shape. Place cord 4 over cords 2 & 3 and under cord 1. Pull cord 1 under cords 2 & 3 and through the loop between cords 3 & 4. Pull tight to complete the square knot. Continue tying square knots with the remaining pieces of cord until you have 7 total square knots. Alternating cords tie 7 rows with 1 inch of space between each row. Alternating cords means that for every other row you remove the first two cords and the last 2 cords and square knot the others. So you will tie 6 square knots (cords 3-26); then tie 7 square knots (all cords); then tie 6 square knots (cords 3-26); then tie 7 square knots (all cords); then tie 6 square knots (3-26); then tie 7 square knots (all cords). Next, tie 2 square knots in the middle using cords 11-14 and 15-18. Place planter on top of the 2 square knots in the 8th row. Bring cords 9-10 & 19-20 over & around the planter & create a square knot so that it falls in the middle of the planter. Tie a wrapping knot 3.5 inches from the base of the last 2 square knots with cords 9-20 (we used a different colored cord to demonstrate this knot better). Simply gather the center cords & grab your 30” piece of cord set aside from step 1. Bend end of the cord into a loop & place over the gathered cords. Take the long end of the cord & wrap it behind & around the gathered cords repeatedly. Once at the end, take the end of the wrapped cord & pull it through the loop you made at the beginning. Then, pull on the cord on the opposite end of the wrapping knot. This will pull the loop up & underneath the knot to tighten. Trim the ends that are sticking out. Place your planter inside the basket. Make square knots on both sides of planter as far down as you like. Trim ends.